"Do what you think is right and hope that you'll gain people's respect and appreciation for it," Rush's drummer Neil Peart states sagely as he, bassist/vocalist Geddy Lee and guitarist Alex Lifeson cool their heels in Toronto a few days before resuming their Grace Under Pressure tour. Peart summarizes Rush's basic philosophy, musing on why Canada's most famous ex-bar band failed to set radio playlists on fire with Signals back in 1982. "There was an attempt to bridge such diverse elements as composition and different musical styles, then trying to make it all co-exist," he explains. "That's always been agreat challenge for us - to take diverse styles and somehow make them blend. Signals was still a period of experimentation. We hadn't gotten things right from the bottom, from the writing of the songs. We weren't confident. But it was certainly worth it. I don't take anything away from the album because of the fact that it was exploratory. That's the ground work that makes an album like Grace Under Pressure possible." Compared to previous Rush releases, Signals went over like the proverbial concrete balloon. People bought it, sure. But Geddy Lee for one, is well aware that the band lost a few stalwart fans." He says, "We realized a few things had shifted out of perspective." One of those things was Alex Lifeson. His two band mates agree that the guitarist wasn't thrilled with the synth-happy tangent Rush were taking. "The music that was turning us on at the time of Signals was synthesizer music, so it led us in that direction," Lee says. "With me playing and writing more on keyboards, it was a natural evolution. In the past. I used to write on bass and Alex would write on guitar. I changed as the albums progressed, and with Signals I wrote almost everything on keyboards. I didn't worry so much about playing bass when we started recording, so the keyboards started taking a leading role. It was another side of the band and that's good. Alex got a little frustrated, but that's good too. When you're a little angry, you tend to put out more." 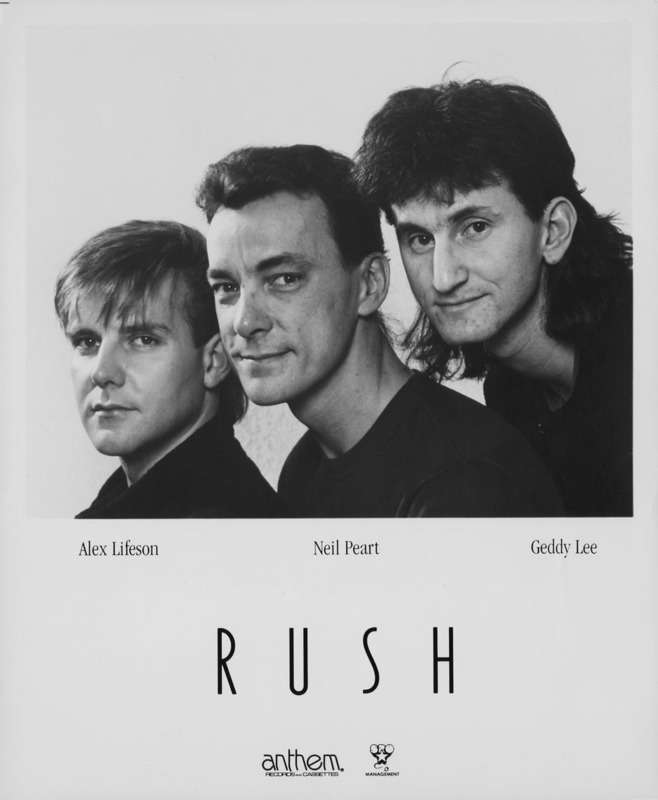 Apart from the toning-down of Lifeson's guitar on that album, some critics felt the keyboards gave Rush's music an even colder, more sterile edge than before: Lee is well aware that the synth boom is a haven for musical cretins and the minimally talented, but he remains convinced that the instruments have value. "The fact that there are more drum machines and more sequencers in use means that there are more people with limited technical and musical ability sounding more competent than they are," observes Lee. "But while technology is taking the soul out of music, it's also creating an interesting new style." Still, Grace Under Pressure hints that Rush took to heart Lifeson's discontent as well as the relative public indifference that greeted Signals. Lee didn't toss his synths on the trash heap, but he's toned them down, realizing that "We're making music for self-expression, but we're also making music for people to enjoy." While the album credits neatly divide the duties into 'Music: Lee and Lifeson' and 'Lyrics: Peart,' Lee claims it's never that cut-and-dried. "Most of what gets written lyrically and musically comes after a lot of talk," he says. "We'll sit around a table having coffee in the morning and just talk about the song, what it means, what the music should say. How that music should echo the lyrics and how the lyrics should tie in with the music. That's something you can't reflect in the credits." Peart agrees. "I'm actually insecure about a piece of work until it's been sung successfully. There's a lot of collaborating with Geddy on the lyrics because he's singing them. He has to have an empathy and an understanding word by word - a rhythmic feel, phrasing-wise and in meaning too. There can be things that are very clear to me and very opaque to everyone else. "The odd word comes out accidentally though. On this album, I remember that before he really learned the words well, he sang a couple of things that were accidents but were great. So I consequently wrote them into the lyrics or remembered them for future reference as an interesting mix-up of words. We save a lot of things. Like we've had the Fear trilogy culminate on this album with what was actually part one. All of three parts were sketched out at the same time four years ago during the era of Moving Pictures. They were used as they were finished. I happened to finish the third part first. then the second, then the first. There are things still hanging around, pieces of music that have been around for two albums, that we still like but haven't found a proper place for." Even this late in the game, with a long string of successful LPs in their wake, there are rumors that Rush have been under pressure from their label to stick to tried-andtrue musical formulas. Peart admits the band have done some skirmishing in the corporate hallways, lately, but that it's "not near what it was when it was a matter of life and death. When you're a band with a reasonable track record, you have the trump card. All you have to do is say, 'No.' It's the hardest lesson for bands to learn. To say no. If you don't, it becomes self-destructive. Like with playing live - up to a point. You're searching for work. You don't care how far away gigs are. You'll take anything because it's a buyer's market, and you want to work, and you want to get up and play for people. "But at a certain point. demand starts to exceed supply in human terms - which was a terrible thing we faced. We'd never said no to a show, and consequently people were taking advantage of that. We were working for weeks without taking a break. Just play and drive and play and drive. If you don't say no and establish your own values, you'll be crushed. They will use you and manipulate you. All you have to do is not allow them to." That's been Rush's guiding theme almost from the start: the triumph of the individual over forces that deny that individuality. Channeled through Peart's lyrics, it's a relentless message that some critics have had trouble with over the years. "The songs never felt cold to me because I could understand the spirit with which they were written," Lee says, referring to the numbers on Grace Under Pressure as well as to the old Rush classics. "I couldn't have sung those songs with any conviction otherwise. But I can understand how people didn't get them. We were all going through a similiar thing at the same time. Neil was a little more...intense about it. We're fortunate now to have been around long enough for change to be reflected. I think a lot of what we were saying then - musically and lyrically - still holds true, but we're saying it in a more mature way."